We bring forth highly efficient Portable Centering Machine which drills centre holes on face of 80 to 480 mm dia round or hex stock irrespective of its length, in less than 3 minutes. Portable Centering Machine is attached to the face of the job finds true centre by itself. Weighing only 28.5 kgs, this machine is portable and can centre saw cut pieces before loading on machine. 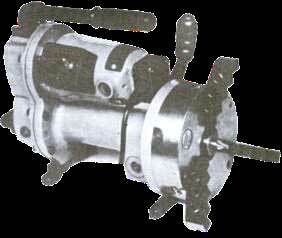 The machine runs on single phase 230 v supply and has the stroke of 53 mm and has spindle bore of 16 mm. it has standard reverse jaws which can be mounted on jobs from 80 to 300 and with extended jaws it can centre drill jobs upto 480 mm.